How many times have you battled a tape measure to try and figure out a if new piece of furniture will actually fit in your living room? 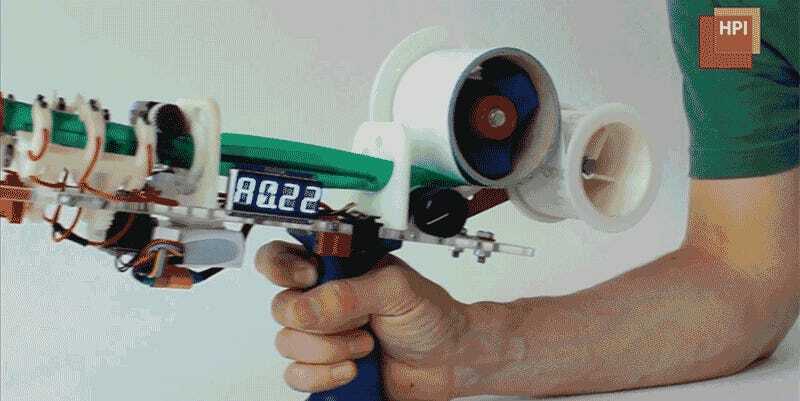 With the ProtoPiper—a heavily upgraded tape gun—you can quickly build a full-scale mockup of almost any object and know for sure how big it will be. 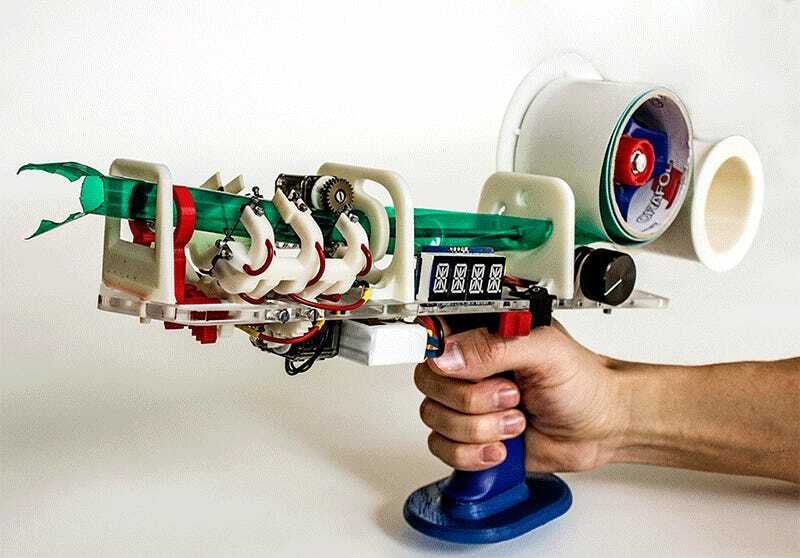 Developed by a team of researchers at the Human Computer Interaction lab at the Hasso-Plattner-Institut, the ProtoPiper is similar to a 3D printer in that it lets you build prototypes for testing purposes. But unlike a 3D printer, it’s able to do it in minutes, not hours, because it doesn’t worry about all the minute details. The ProtoPiper was designed and engineered to recreate the wireframe models you usually see in 3D modeling software, but at a much larger scale than seen on a computer screen. Instead of layers of melted plastic, it turns rolls of adhesive tape into strong but lightweight hollow plastic tubes that serve as building blocks for creating the life-size prototypes. Working with custom software, the ProtoPiper automatically draws tape from a roll, shapes and seals it into a sturdy tube, cuts it to the appropriate length, and even creates wings on either end so the pieces can be easily stuck together and assembled into a larger object. Think of it as Lego on demand. In a matter of minutes you’ll know for sure whether or not that new sofa you’ve been eyeing will actually fit between the lamp and bookshelf in your living room. But don’t cheap out and try to use a ProtoPiper prototype as actual furniture, because it’s simply not going to support your weight. It can, however, be used to create prototypes of objects that do more than just sit there. The team behind the ProtoPiper has even managed to mock up a collapsing umbrella that won’t keep the rain off your head, but will let designers perfect its form and dimensions before paying for more functional prototypes. It’s another tool for inventors that makes it easier and quicker to take their ideas from concepts to products.